Yesterday I sent the e-mail (at the foot of this post) to Alex Neil, Cabinet Secretary for Health and Well-being for the Scottish Government. It should be self explanatory. (1) Freedom of Information (FOI) returns have now been received from all 22 Scottish NHS Boards on the subject of how they record payments to healthcare workers from the Pharmaceutical Industry and if these are open and transparent to all. The results are worse than disappointing. In case you think that this could not affect Scotland, well as just one example, Henry A. Nasrallah came to NHS Forth Valley and gave sponsored education on Risperdal in July 2009. He is in the top ten educators earning from the Pharmaceutical Industry with at least $647,341 changing hands. (3) Scotland (and the UK) do NOT have a Sunshine Act. 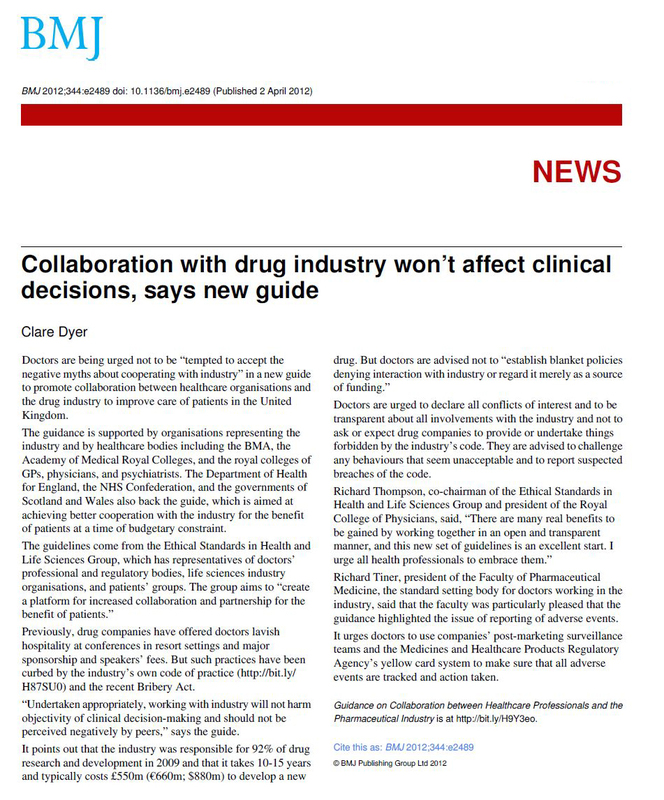 What we have is the Guidance on Joint-Working between NHS-Scotland and the Pharmaceutical Industry: A Common Understanding 2012 – Working Together For Patients. As guidance it was brought into effect in November 2012 and the Guidance was developed under the Chairmanship of Ian Mullen who was involved in this at the same time as he was Chairman of NHS Forth Valley. Despite this and the fullsome promises in the foreword by Ian Mullen, NHS Forth Valley has never had a functioning register of any joint-working other than the listed Interests of Board members. The FOI returns across all 22 NHS Scottish Boards have since evidenced that NHS Forth Valley, in this failing, was closer to the norm rather than the exception. 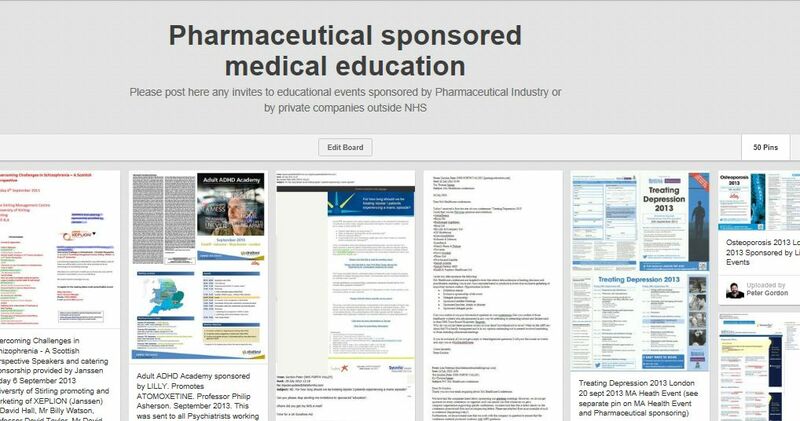 (5) I have been collecting over the last 3 months all details of Pharmaceutical Sponsored Education that comes my way. I do not see Pharmaceutical Reps and so this will most likely be unrepresentative sample of the wider picture. Have a look and form your own opinion. 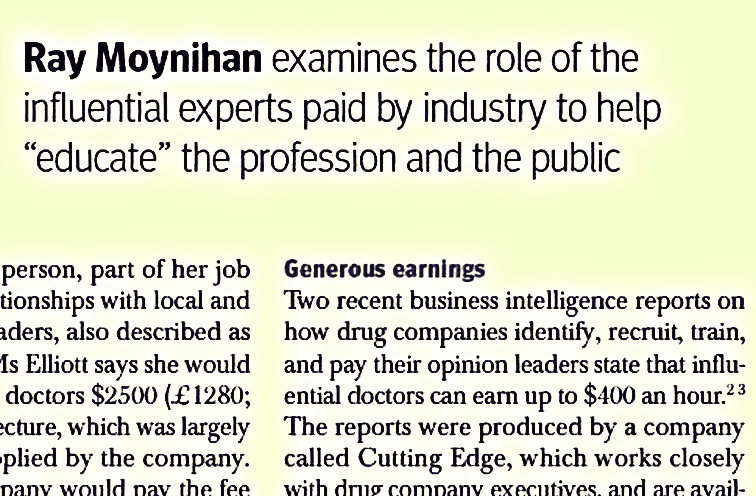 (6) Last year £40 million was paid in total to healthcare workers in the UK from the Pharmaceutical Industry. Whatever proportion went to Scotland, it certainly is not represented in what few returns have been made by doctors to their NHS Boards. So much for transparency. And what then of the ‘probity’ section all doctors sign as part of mandatory GMC regulations for Appraisal and Revalidation? 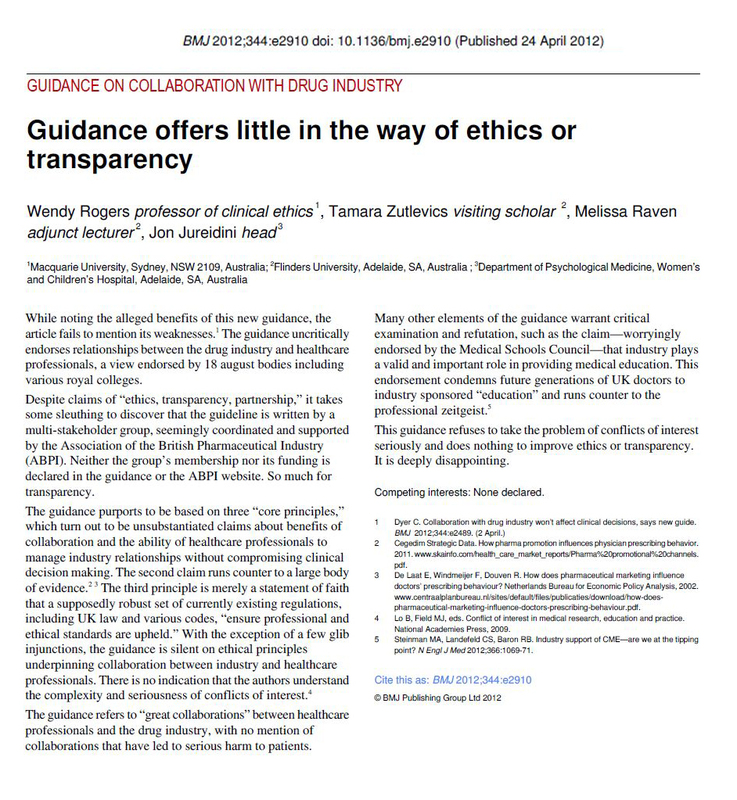 (7) An area of legitimate concern must relate to academics and doctors that have been termed as “Key Opinion leaders” and whose joint-working with the Pharmaceutical Industry can be considerable . I must confess that I had not been especially aware of this until the recent UK-wide discussion on dementia diagnosis was raised in leading journals. I have always advocated for the timely, personalised and holistic diagnosis of dementia pointing out that considerable harms may be associated with the prevailing imperative of ‘early diagnosis’. I was a lead in this debate before just about any other. I was thus concerned when the Key Opinion Leaders in dementia in their reply to the Open letter that I had joined with Grassroots Doctors on this subject made no declarations of interest. Not one. I knew this was incorrect. 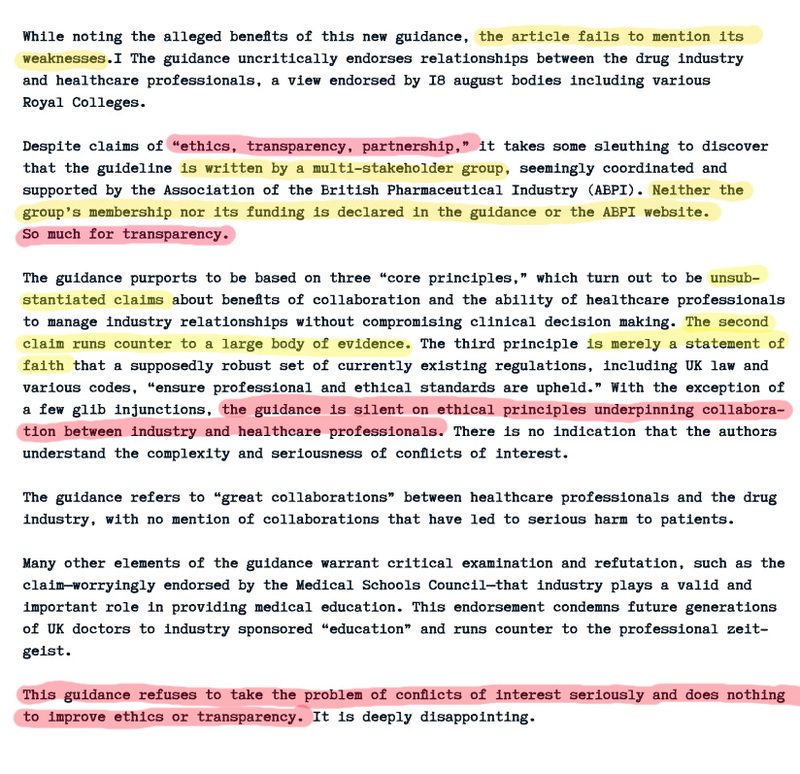 “Our letter was initially published as a rapid response, where it triggered a reply from an eminent group of doctors who declared that they had no competing interests. 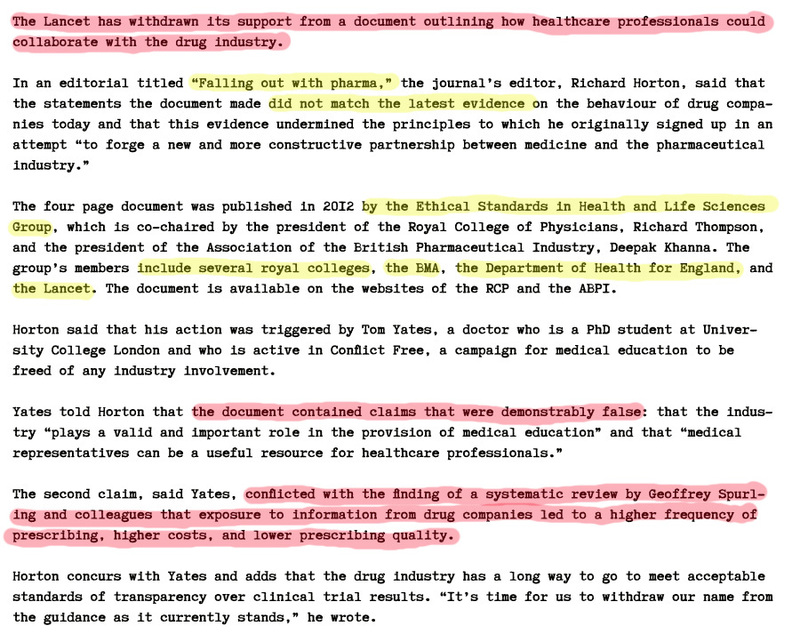 The letter was subsequently published as an Observation article, and a further reply came from many of the same authors, several of whom decided on this occasion to declare interests, including financial support from pharmaceutical companies and appointments related to the field of dementia. These conflicts are not wrong in themselves, and do not invalidate their comments, but neither are they unimportant, nor did they arise in the intervening three-month period between the letters. What changed? A prick of the conscience? A word from the editor? 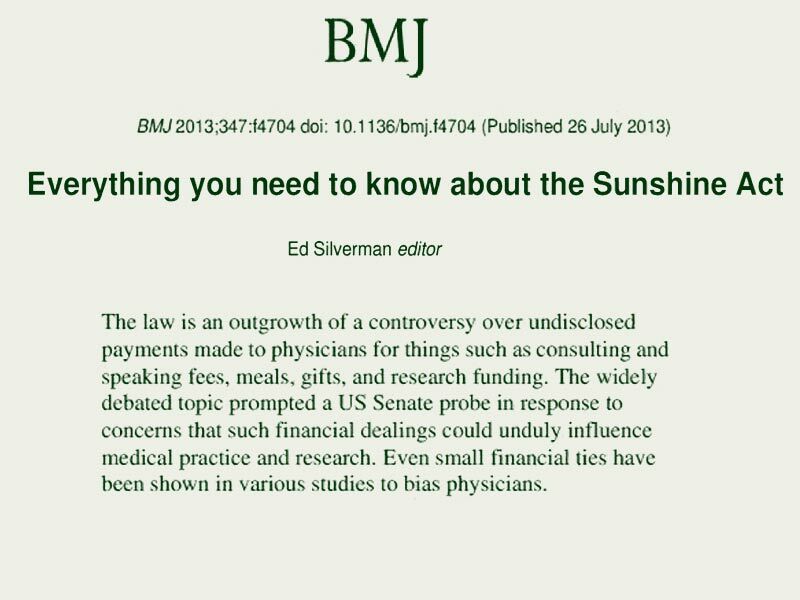 Or perhaps the fact that the BMJ tightened its wording about conflicts of interests in January 2013 – between the two submissions. Since this time I have collected the declarations made by all the Key Opinion Leaders, at least those of whom I am most aware that educate us on dementia, whether it be in practice, prescribing or policy. My absolute determination is to look at this as a group and thus I would wish no doctor to be singled out. This is not about reputations, or simply conflicts of interest, it is about transparency and that goal that we surely all share: the quest for scientific objectivity. I wish to thank Dr Whitehouse for allowing me to use his words in this film. 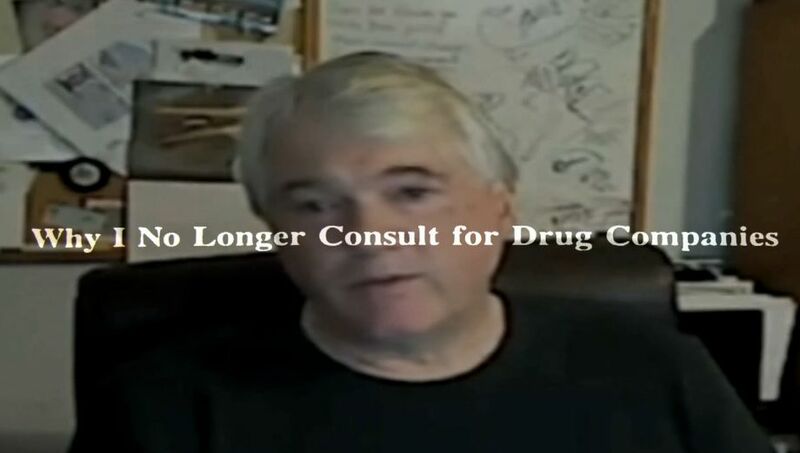 I have made this film as I share Dr Whitehouse’s concern about the entanglement of pharmaceutical marketing/health industries with continuing medical education. I also share concern that when it comes to the Key opinion leaders in dementia that the talk of “transparency” is only talk. 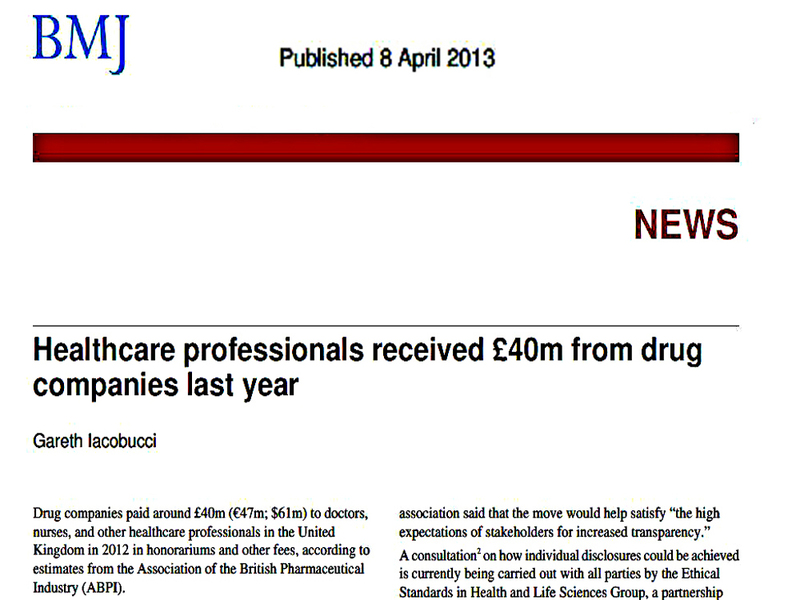 Last year £40 million was paid by Pharma to healthcare workers in the UK. 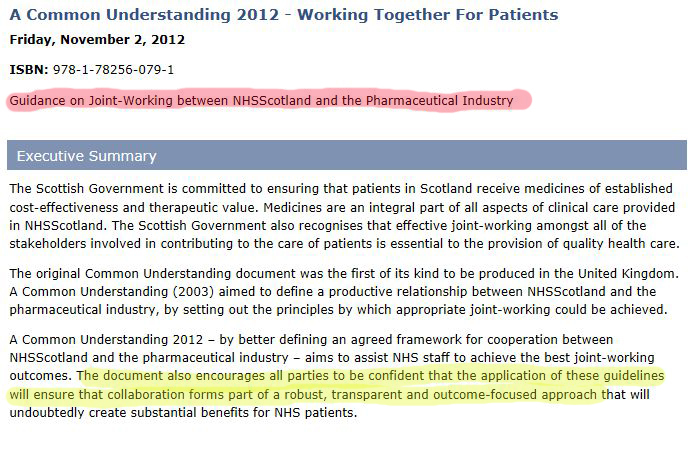 Research into Scottish NHS Hospitality Registers evidences that payments from Pharmaceutical Industry are consistently not being declared in Registers (if indeed there is a functioning NHS register!) We are in the dark about this. 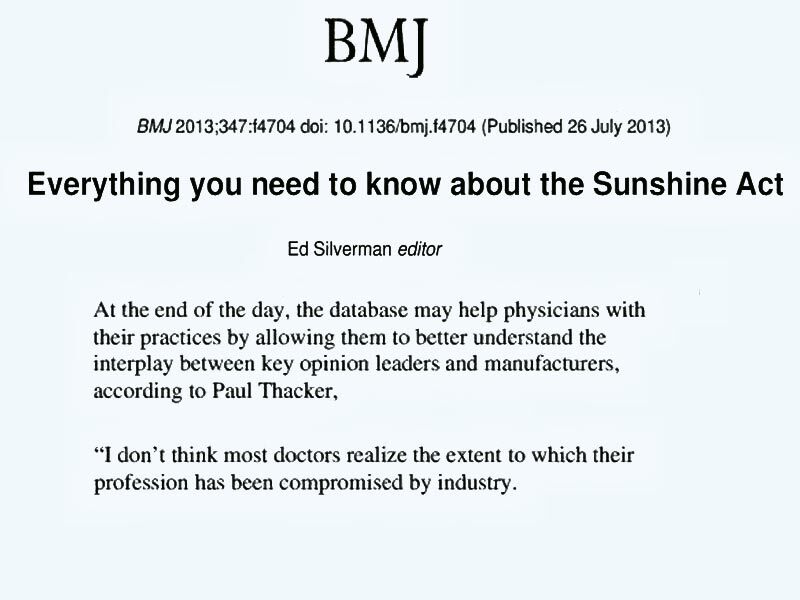 Unlike USA we have no ‘Sunshine Act.’ The UK has a meaningless, one-sided, code called the ABPI code. 89% of British Medical journal readers (999 out of 1128), in a poll of April 2013, agreed that drug companies should publish the names of doctors to whom they make donations. That is a striking consensus. The Pinterest Board on Key Opinion Leaders in Dementia is here . I was going to write about this but, for so many reasons, I find this very difficult. 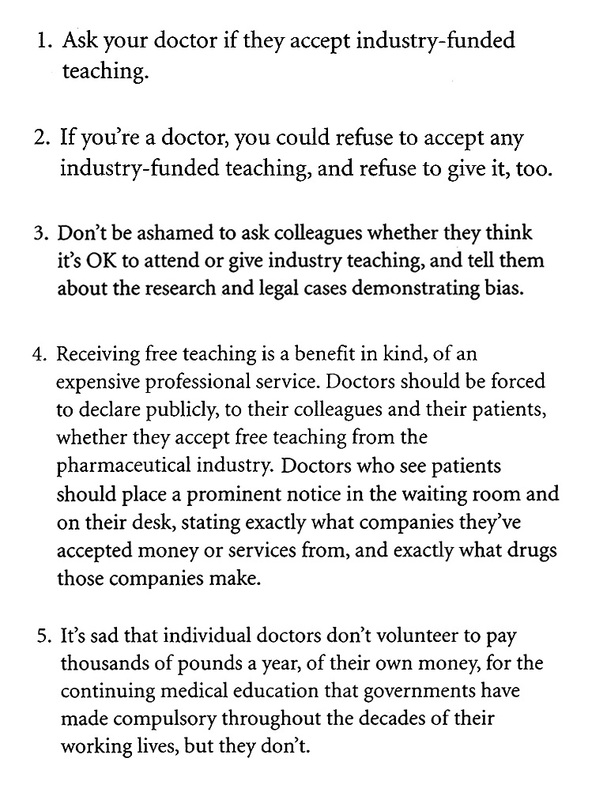 I am particularly concerned that I am simply a doctor, not an investigator (and do not wish to be). I hope that all readers of this realise that my only determination is to be fair to all, to follow evidence, ethics, professionalism and the humanity that I hope I have within me.